I have helped to set up 2 loyalty programs, and worked with a bunch of companies which run such programs. I have also worked on many affiliate programs which work along similar lines for their affiliates. I always advise that companies be generous with their loyalty programs, use them to in still good will. I learned this lesson from Sainsburys, which use their Nectar Points system for compensation, for reward and loyalty and use it very effectively. With Sainsburys, If you make a complaint via Twitter, Email or Phone they almost instantly refund the equivalent points and apologise, so they buy your loyalty as you will want to spend your points and save more points, so you’re likely to continue as a customer. I recently had cause to order a wheelbarrow full of doughnuts, personally I’m a Sainsburys doughnut fan but they generally don’t last long even if picked up fresh, by late the following day they are already heading to stale. I passed the Krispy Kreme store and heard about them recently being used for weddings and leaving parties etc, so I called in the store and the young woman who worked there were very helpful. She explained they were hand-made in a factory each day not in that particular store (didn’t know that), that they generally last 3 days before starting to turn but some people say they get 5 days. She explained the online ordering process, and about which flavours were most popular (Nutella)… long story short she answered all my questions and I were sold and decided I’d shell out the £1 per doughnut vs 6-10 doughnuts for a quid elsewhere. I discovered that Krispy Kreme operate a Loyalty Program and app called “Friends of Krispy Kreme” aka FOKK, which tells you about each flavour, about the special edition doughnuts, and lets you register your purchases. It also has a dozen “Friends of Krispy Kreme Rewards” or FOKKR, some of the more interesting ones are below, but there are more. Free Glazed Doughnut upon Joining. 3rd Visit within a month = Free Doughnut or Hot Drink. Every 6 Dozen Doughnuts bought, you get 1 Dozen Glazed Free. Free Collectible Mug on 9th Visit. Since I had been in the store a week before, and were decided I signed up for FOKKR / Online Purchases and I ordered 4 x Dozen Doughnuts (48 in all) using Click and Collect as I were advised it were the best way to ensure I got the doughnuts I wanted on the day I wanted them as they often sell out for the day. I thought awesome well on my way to a free dozen doughnuts and a free collectible mug. I emailed and tweeted Krispy Kreme asking how I register my online purchase for my Loyalty Rewards and I were told “Sorry this isn’t available, its only for in-store purchases”. This is bizarre, an App which is an online service, isn’t available for online purchases ? Surely they need to go back to using a paper card and a stamp, if its only for in-store use. So a company established in 1937, nearly 80 yrs ago with over 1,000 locations across 30 countries with a turn over of a HALF A BILLION DOLLARS, can’t even connect their app to their website, 2 things which in a modern online business world should be absolute basics. I guess it does imply that only retail purchases count, but the same “small print” also refers to “Reward Card” as a physical card and doesn’t explicitly refer to the app. It even tells you directly above, if you lose your card email them, so certainly not about the App. The T&C have been recycled and not “Search and Replaced” very well at all. I’d say it were reasonable to assume the print were out of date or didn’t apply to the app. Even as a good will gesture since no where online, in-store or even in the app did it tell me online purchases wouldn’t count. Instead I’m told, sorry we can’t do that. If ever you needed a lesson on NOT to run a loyalty program, or how to lose a customer, this right here is it it. Just as a side note I could have gone to Greggs, Sainsburys, Tesco or even a local bakery, and for what it cost me I could have gotten 250+ doughnuts from the main supermarkets (and collected Loyalty Points), 180+ mixed doughnuts (topped, creams, jams, custards, nutella, peanutbutter, glazed, anything I wanted) from my local baker. Instead I got 48 from Krispy Kreme and shown the worst Loyalty Program ever. I have worked with many companies with Loyalty Programs, I’ve helped 2 start up a program, helped with who knows how many affiliate programs. I have always told clients be GENEROUS with your loyalty programs, put extra points on there, use it for compensation and rewards, add good will into it. While you maybe giving away pennies on the pound, people will be invested in to the program, and keep them coming back to build on it. That’s why its called Loyalty Program. I were already planning to pick up a dozen doughnuts for one my clients who always brings cupcakes, I were then thinking 1 more order and I get a free dozen. That would be 4 purchases off me, a new customer. I’d then be thinking I’m half way to a free mug, so there you go I would be already invested by this point and I’m more likely to complete the remaining 5 purchases. Now, I won’t buy there on principle, back to Sainsburys doughnuts for me. 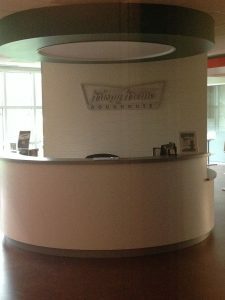 Krispy Kreme Customer Desk by Jrayalme.